This is a respect thread about the Human Robot. The Killer Robot. M-11. This is his handbook entry which saves me the trouble of explaining his origin, motivations, and history. M-11 is arguably the most powerful member of the group called Agents of Atlas. He's the strong silent type with pretty interesting and powerful abilities. This piece of dialogue basically explains, in a nutshell, M-11's abilities. However, there are a couple of abilities that Gorilla Man left out in that description of M-11. One of which was his super strength. I'm not entirely sure where to rank M-11's strength level, but here are some of his best striking/lifting/overpowering feats. First, let's start off with some decent feats. Scan 1-2: Smashes through a brick wall; Scan 3: Casually breaks down reinforced metal doors to save President Eisenhower. Scan 1: Lifts a tank and uses it as a barricade to knock over some more metal doors; Scan 2: Takes apart a tank. Overpowers and crushes a Wakandan while simultaneously crushing his firearm. Admittedly, this is pretty low-end stuff (aside from the tank). Let's get past the baby stuff and get onto some more impressive feats. Scan 1-2: M-11 and Jimmy Woo (Agents of Atlas leader) are looking for a false room. M-11 is instructed to punch an entrance into this sealed off room and his blows literally shake the entire castle. The punches are so loud that, on the other side of the castle, the rest of the Agents of Atlas hear the "BOOM" and they think Jimmy and M-11 are in danger. Not exactly on the small side. Scan 1: Overpowers and nearly crushes Bucky Barnes (AKA the Winter Soldier); Scan 2: Holds up the weight of an entire helicopter (with the additional weight of a full-grown man and gorilla) after Barnes damages the rotors of the chopper. Scan 1: Wrestles with and stalemates Luke Cage; Scan 2: Overpowers, crushes, and nearly KO's both Luke Cage and Captain America (Bucky) until Wolverine steps in and saves them. (I didn't crop these images to be dishonest or misleading. 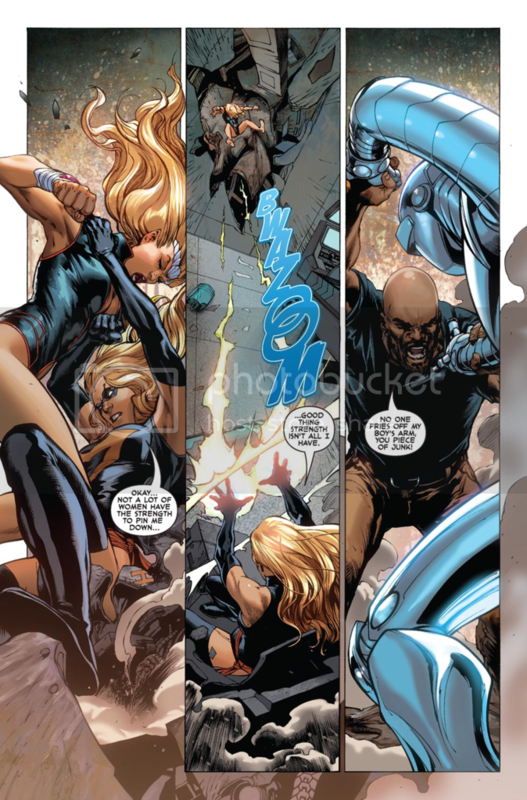 In Agents of Atlas Issue #5, the New Avengers and Agents of Atlas fight each other and the rest of the scans include images of other members of the group fighting one another). Scan 1: Overpowers and crushes the windpipe of Mr. X before frying him with electricity; Scan 2-3: Crushes and overpowers Spider-Man until Peter manages to squeeze out of M-11's grip. 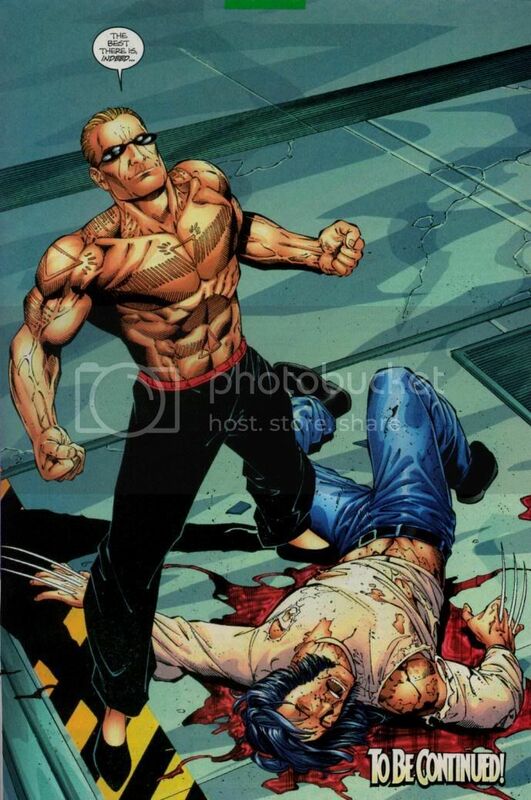 Mr. X is strong and skilled enough to stomp the likes of Wolverine. He's also fast enough to do this. Now, let's move on to M-11's electrical abilities. We've already seen what it could do to Mr. X, so let's see what else it can do. Electrical energy projection knocking out fodder. Projects 20,000 volts. It should be noted that he has been upgraded and improved upon since this origin. Scan 1-2: Electricity makes Giant Man scream out in pain. And yeah, the Agents of Atlas fought the classic Avengers. M-11 actually did REALLY well for himself against all of them. I'll get into that later. Here are scans of M-11 simply one-shotting characters. Scan 1: Wolverine; Scan 2: Angel; Scan 3: Luke Cage. Again, they were all knocked out after these attacks. I should point out that Colossus does manage to overpower and hold down M-11, so that proves how much of a strength limit he has. Now time for some ABC logic! Scan 1: Electrifies, fodderizes, and one-shots rock formation monsters that Namora, a character with Namor-level strength, couldn't; Scan 2: Electrifies, fodderizes, and one-shots a Cyclops that Namora, again, could not. 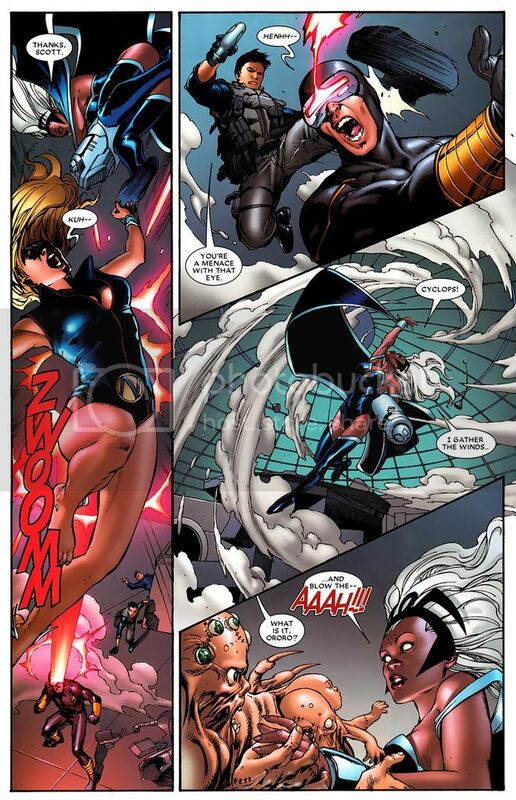 Scan 1: Namora blitzes the rock formation monster and fails to KO it; Scan 2: Cyclops tanks a hit from Namora. I know. I know. ABC logic is pretty shoddy and we're talking about blunt force vs energy attacks, but that electricity still bypassed a high level of durability and resilience that not even Namora could take down with as much ease as M-11. Scan 1-2: Electricity manages to stagger the Hulk until Iron Man joins the fray and blasts the Hulk. Inevitably, this leads to the Hulk screaming out in pain and literally admits that he's in pain. Although this was a group effort and Hulk didn't start screaming until Iron Man started blasting him, this is still impressive. M-11's toughness and dexterity is arguably one of the most impressive things about him. All four of these scans display just how futile firearms against him, but I even threw in a scan of M-11 no-selling laser attacks as well. Scan 1: Force-field no-sells a heat ray designed to KO Namora, hollow point bullets, and a particle gun; Scan 2: Tanks several bullets while blocking some with force-field; Scan 3: Saves team from being shot by assault rifles; Scan 4: Unfortunately, he didn't extend his force-field in a dome, so Venus got hit by an arrow from behind. Once he makes it a dome, they are fine; Scan 5: Blocks more assault rifle fire with shields. Scan 1-2: No-sells the heat of lava and keeps out several lava men (classic Avengers villain fodder). M-11's force-field versatility is displayed here. He can not only fire through the force-field with his death ray, but he can also create small openings. The almighty Ice Man can't stand up to a dragon's fire for very long. However, M-11's force-field does just fine against it. Here is another scan of him withstanding fire. This time it's mystical in nature. Scan 1: M-11 blocks beams from Marvel Boy's saucer with his force-fields; Scan 2-3: Here is what his saucer is capable of. It manages to send Hulk flying as well as briefly hold him down as it blasts him. M-11's force-fields no-sold that attack. Scan 1: Namora claims that she and M-11 are the only members of Atlas that could survive a chain reaction of a ship full of mines exploding; Scan 2: Luke Cage hurts his hand punching off the head of M-11 (should be noted that M-11 was damaged due to Wolverine); Scan 3: No-sells Wasp's sting; Scan 4: Tanks a blast from Cyclops; Scan 5: Tanks a shield toss to the head by Captain America (Winter Soldier). Before I move on I'd like to point out that the shield toss from Bucky was with his mechanical arm and that Wasp's stings are nothing to laugh at. Next up, we have M-11's force-field tanking a combination of blows from Colossus, lightning from Storm, and a laser blast from Cyclops. It isn't until Wolverine joins the fray that the force-fields are broken. There is A LOT happening in the scan below. Not only is Ice Man getting owned by M-11, but he's doing it at the same time as blocking Cyclops' eye beams with his force-fields. This scan also displays M-11's self-repairing ability which is arguably one of his coolest abilities. I'll get more into his 'healing factor' later. The following scans are, by far, his best durability/force-field feats. Scan 1: Tanks a blitz from a pissed off underwater Namor. It might look like Namora saved his life, but you'll see how formidable he can be with his Death Ray later; Scan 2: Force-field literally bounces an annoyed Thor off and prevents him from blitzing. However, once Thor gets serious he strikes M-11 with Mjolnir which breaks his force-field, but doesn't destroy M-11. In fact, in the next panel he's perfectly okay. Needless to say, M-11 is pretty tough. You've already seen Wolverine failing to incapacitate M-11, so let's see what else has failed to put him down. Not only can M-11 access any computer database on Earth, but he was also given a restoration enchantment which allows his pieces to be put together automatically. This was the rest of the cropped scan that I showed earlier of Cyclops blasting M-11. Marvel Boy's saucer does a number on M-11 (he's clearly not as durable as the Hulk), but his self-repairing ability is showcased for the first time after getting taken apart. The only reason the saucer breaks through M-11's force-fields is because Marvel Boy had added his own tech into M-11 (like the force-field) which he simply turned off. Hence the, "And I can take it away!!" M-11 is not by any means a speedster. In fact, he's barely got street level speed and he often prefers to tank attacks instead of dodging (although with good reason), but at the very least, he's a bullet timer when it comes to speed. Scan 1: Displays bullet timing speed by erecting a force-field after high caliber bullets were fired at his allies; Scan 2: Manages to extend his arm through a wall and prevents a guy from pulling a trigger for a gun (triggers can be pulled in 0.25 seconds); Scan 3: Manages to tag and grab Spider-Man (his Spider sense was working just fine). He tends to only use his speed when he needs to. Here is, by far, his most impressive weapon/ability. I saved the best for last. M-11's death ray is extremely powerful. We've already seen what it can do to Ice Man. Let's examine who else hes owned. Here is M-11 vaporizing fodder. Scan 1-3: Turns foot soldiers into dust; Scan 4: Disintegrates Skrull foot soldiers; Scan 5: One-shots and destroys Weapon X nameless characters. These guys might not actually be fodder since, in that same page, we see Namora punching one; Scan 6: Vaporizes zombies; Scan 7: Blows off someone's head; Scan 8: Eviscerates undead people. We've already seen this scan, but here is another example of M-11 taking down fodder when he destroys the Lava Men. Scan 1-2: Melts the skin off of Wolverine's arm. He's in so much pain that he can barely even stand, let alone fight. 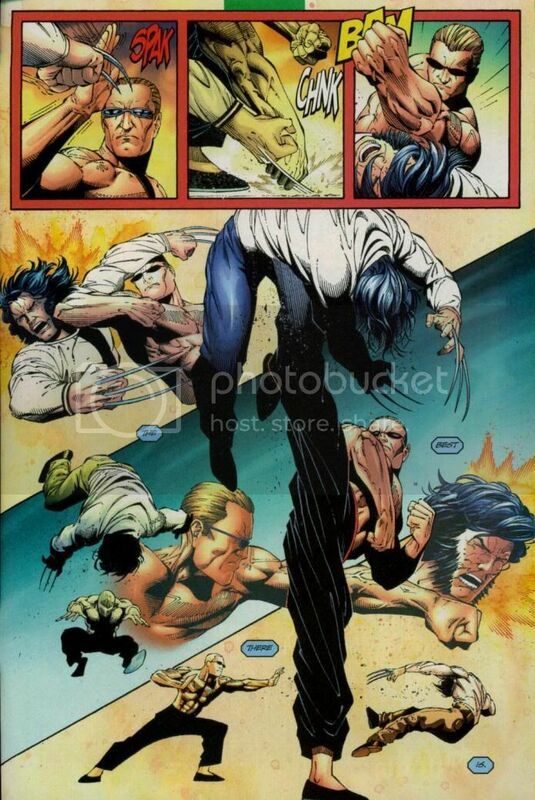 Wolverine doesn't get back in the fight for several pages until his arm heals. Here we have M-11 (and Namora) easily dispatching and one-shotting tanks. 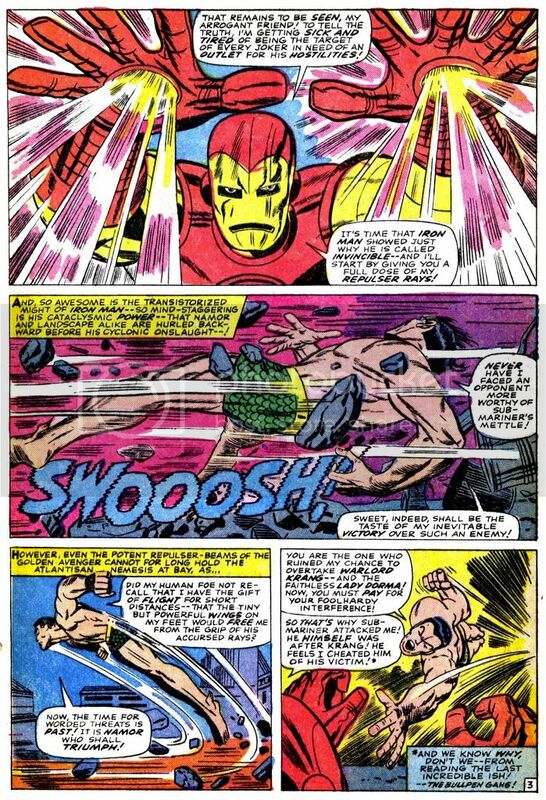 Scan 1-2: Here we have a time displaced classic Iron Man and M-11 blasting one another. 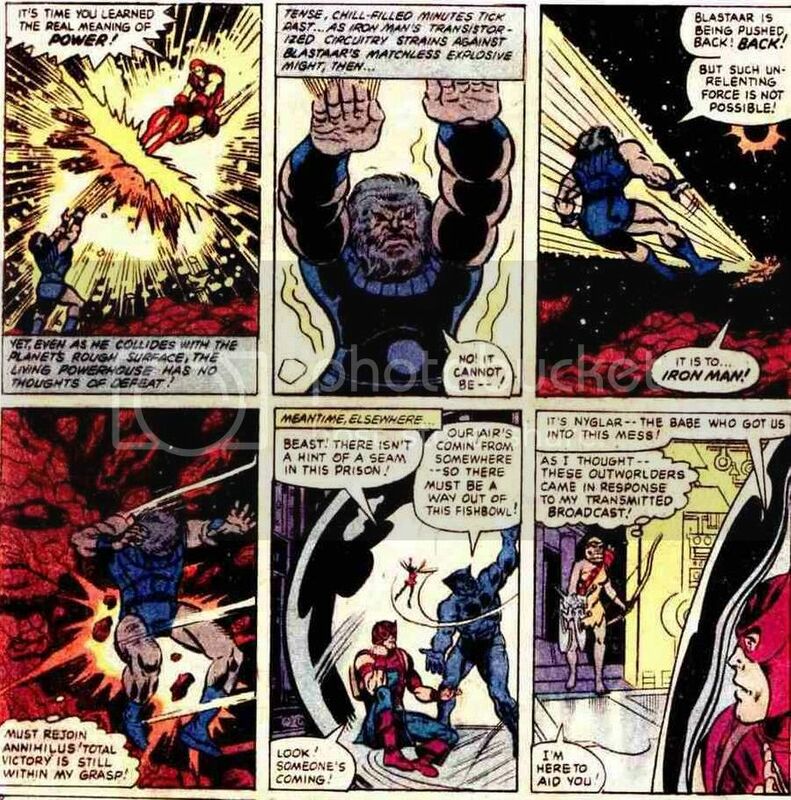 Not only is M-11 able to stalemate Stark without losing power, but after Gorilla Man surprises and distracts Tony, he manages to hurt Iron Man and send him flying. 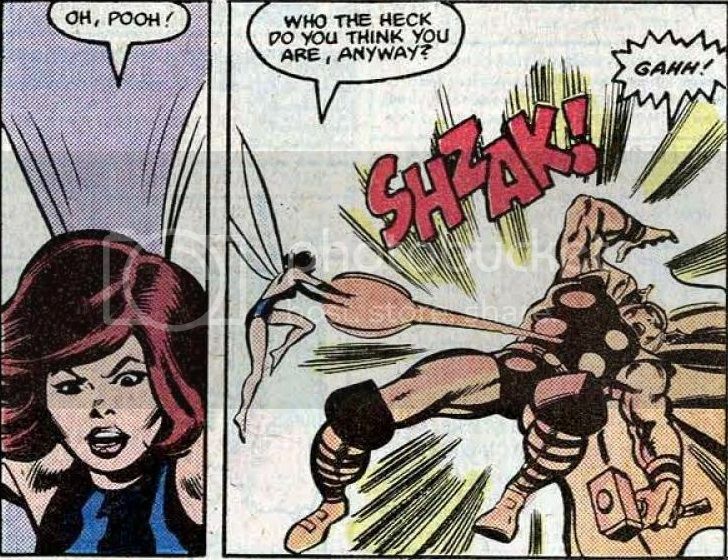 It should also be noted that Pym claims the heat from their clash could melt a glacier and Thor gets blinded and even claims, "It is thought the sun itself has come to Midgard!" Based on my interpretation, the only reason M-11 wins this struggle is because Tony's identity wasn't revealed to the public yet and Gorilla Man distracted Iron Man after saying, "...his armor is filled with more machinery instead of boozy millionaire, bum! You're going down Stark!" Tony is clearly thrown off by this which leads to him losing the clash due to a lack of focus. However, stalemating classic Iron Man for so long is no easy feat. Just ask Blastaar, Namor, or Hercules. Next up we have M-11 taking on the Sub-Mariner underwater. Not only does his beam make Namor scream out in pain, but it also manages to briefly incapacitate him. So much so that M-11 has time to move onto electricuting and fodderizing Atlantean troops. Scan 1-2: One-shots a mind-controlled Namora. Again, this character is supposed to be Namor's equal. Statements aren't always reliable though. Cyclops, Ms. Marvel, and Hulk can vouch for me on this one. 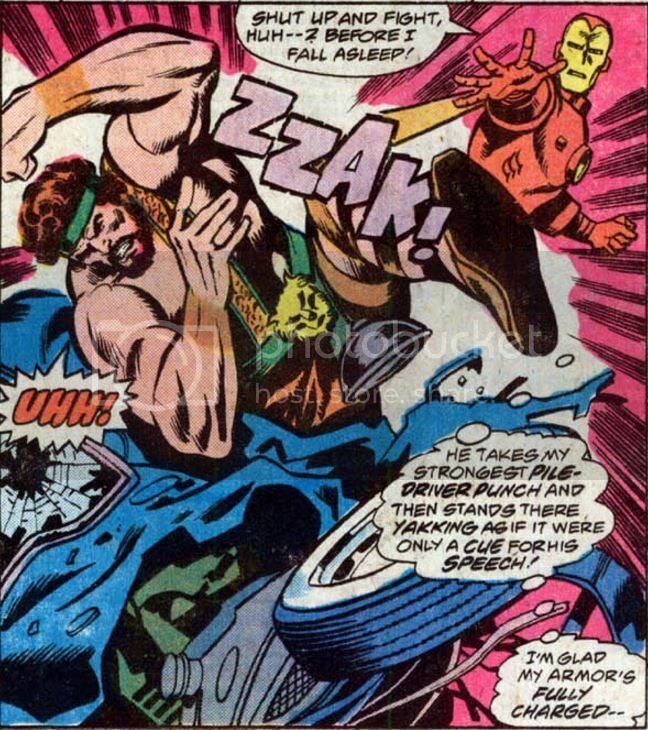 Scan 1: Blasts Hulk in the face and not only makes him scream out in pain, but the Hulk is still in so much pain after the blast that he gets on his knees and covers his face in pain instead of instantly recovering or shrugging off the blast. Scan 2: Hurts Hulk again by blasting him in the face. This was the same Hulk that was angry/powerful enough to take on the classic Avengers and Agents of Atlas at the same time. In the Marvel Universe, it's been established that phasing incapacitates all technology. Unfortunately, M-11 is no exception to this rule. This scan proves that M-11 can project different settings of power from his Death Ray. That means that he can vary the amount of power he emits (which could explain why he didn't KO Namor or kill Namora after he blasted them). X-Men Vs. Agents of Atlas (2009-2010) issue #1 & 2, Atlas (2010) issue #1-5, Avengers Vs. Atlas (2010) issue 1-4, Agents of Atlas (2006) issue 1-6, Agents of Atlas (2009) issue #0-11, Secret Wars (2015). Fear Itself: The Home Front (2011) issue 1-4, Spider-Man Family (2007) issue 4, Thunderbolts (2010) issue 139-140. If you want to know specifics for individual sets of scans, let me know. It'll simply take too long for me to wade through every single scan and issue and match them up. Respect Thread for the Human Killer Robot, M-11.